To basically start out the summer of 2015 with a big bang, comes the highly anticipated sequel to Marvel’s 2012’s ‘Avengers‘ film, which is titled ‘Avengers: Age of Ultron‘. It’s been a long time coming too. Ever since 2008, when we saw Robert Downey Jr. put on the Iron Man suit for the first time, we all knew Marvel Entertainment had a huge franchise on their hands, as they teased a big film called ‘The Avengers‘, which put a lot of our favorite superheroes together to fight evil. After several solo movies with the likes of Hulk, Thor, Captain America, and Iron Man, we finally got an ‘Avengers‘ movie in 2012, which made over $1 billion for Marvel and Disney, and was met with much praise and critical success. It was because of this, that Marvel has announced tons of superhero films through the year 2019 that will play into their overall story arc they have been building since 2008. We’ve all been anxiously awaiting this sequel for quite some time now, with tons of posters and trailers that have more than elevated our calm levels with excitement. Now the time is finally here for another hefty dose of ‘Avengers‘ with each superhero returning along with Joss Whedon directing. First off, ‘Avengers: Age of Ultron‘ is the Avengers movie we need, but not the one we necessarily deserve, to quote a certain police commissioner. 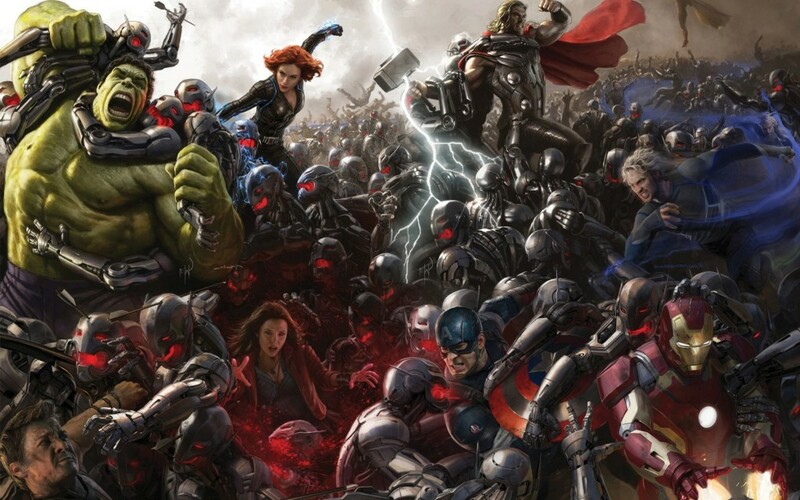 Don’t get me wrong, ‘Avengers: Age of Ultron‘ is a good movie. The characters, the dialogue, and of course the action are all very strong, with a huge emphasis on the action aspect. Other than that, there is no real character development with the exception of one character, and the whole Marvel Universe doesn’t seem to move forward with anything. Instead, it seems like Marvel and Disney just wanted to show big action scene after big action scene for this sequel, which is why I said it’s the film we need. I say this because the first ‘Avengers’ film spent most of the movie gathering these heroes to fight together, and only in the last 20 minutes of the film did we get to see everyone in action at the same time. So it was great to see all of our favorite heroes, win the fight, party afterwards, and have a few jokes with one another, specifically everyone trying to pick up Thor’s hammer. So why is the film called ‘Age of Ultron‘? Well, Tony Stark creates a new artificial intelligence program that he dubs Ultron, which is like Jarvis, but has the ability to be 1000 times more powerful. This program manifests itself into one of Stark’s backup Iron Man machines and is voiced by the amazing James Spader. 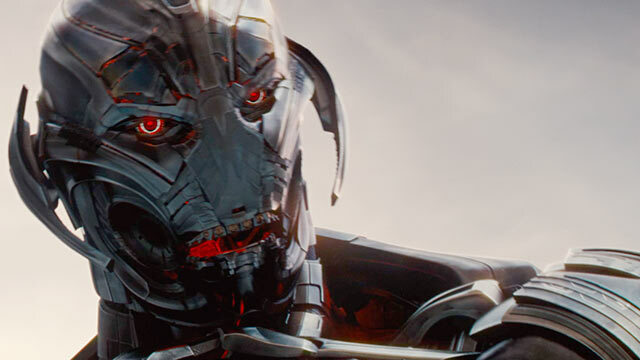 This new program is supposed to protect the Earth from any threat, but Ultron himself thinks that the extinction of the human race is the way to save itself and create peace. As Ultron is literally getting smarter and stronger by the second, ‘The Avengers‘ have a tough time trying to take him down, which leads us on a journey of several epic fight scenes. One of the redeeming qualities here is the amount of time we get to spend with Hawkeye. He’s the only real character who is paid attention to in detail here and moves forward with his story. I know that the other heroes have had their own films, but in ‘Age of Ultron‘, it only seems that they are there to fight the bad guys. Except Hawkeye, whom we find out has a family on rural farm and knows all about his “avenging”. There was a bit of a side storyline of Black Widow and Hulk possibly giving it the ole college try in a relationship, but it’s difficult to say where any of it was going. Perhaps another sequel will tell us. Then we have three new characters introduced to the Avengers, which are Quicksilver (Aaron-Taylor Johnson), Scarlet Witch (Elizabeth Olsen), and Vision (Paul Bettany). You saw Quicksilver in the last ‘X-Men‘ movie last year, played by a different actor, whereas Scarlet Witch is a badass here and as we find out can be your best friend or your worst enemy. Lastly, there is Vision, one of the coolest heroes, who is the complete opposite of Ultron, but just as powerful. Where Ultron wants to only destroy, Vision wants to protect and save. The look of Vision is amazing. They really knocked his practical effects and makeup out of the park. Joss Whedon’s script is great for the amount of action this movie has. When we do get a bit of dialogue between two characters, the brilliance and wit of Whedon’s mind comes full force, specifically when Hawkeye is trying to tell Scarlet witch just how ridiculous everything is. This was a great moment that made me think back to Whedon’s television days. James Spader was born to play the role of Ultron. His voice and mannerism are haunting and scary-as-hell. If they gave voice acting Oscars, Spader would be in the running. ‘Avengers: Age of Ultron‘ is not the movie we deserved, because this film did not forward to the story of the Marvel Universe one bit, nor did it have those special “wow” moments from the first film. Instead, we get some pretty fantastic and epic action scenes with all of our heroes fighting together for over two hours. It doesn’t necessarily make for a bad movie, but just not an excellent one that we thought we’d be getting. And yes, there is a big tease during the credits of the film, so be sure to stay in your seats to see who pops up and where Marvel is going. This entry was posted on Wednesday, April 29th, 2015 at 1:28 pm	and is filed under Comics, Film, News. You can follow any responses to this entry through the RSS 2.0 feed. You can skip to the end and leave a response. Pinging is currently not allowed. « WWE: King of The Ring Tournament Recap! All Hail the New King! Isn't it supposed to be bad luck for the groom to see the bride before the wedding? Well, let's just say I like to live dangerously.